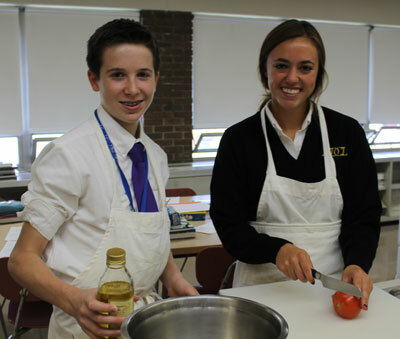 The Family & Consumer Sciences Department of Notre Dame-Cathedral Latin School provides a place in the school community which attempts to meet students' needs for leading a Christian-centered life in today's society. As a department, we offer a field of knowledge and service aiming to strengthen personal and family life. We assist in the development of the whole person, striving to instill a sense of individual and societal responsibility through the use of the students' gifts and talents and generosity in sharing with others. The Family & Consumer Science curriculum attempts to address current needs and seeks to provide instruction in making decisions confidently and performing daily tasks successfully. This curriculum enables students to meet present demands of day to day living with an emphasis on their role in the family, in their community, and within their professions as informed Christian men and women.